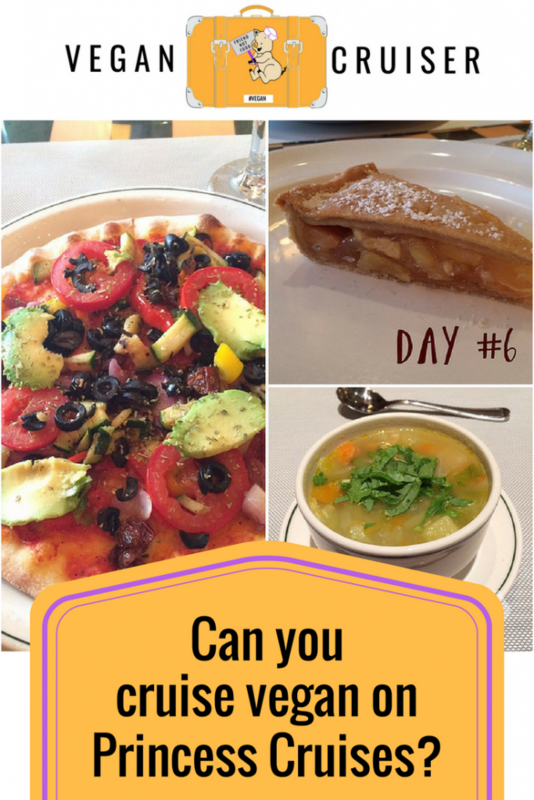 Can you cruise vegan on Princess Cruises? The question on every vegan’s mind when booking a holiday usually is ‘will they be able to cater for me’? Closely followed by ‘wonder what I will need to pack with me’. 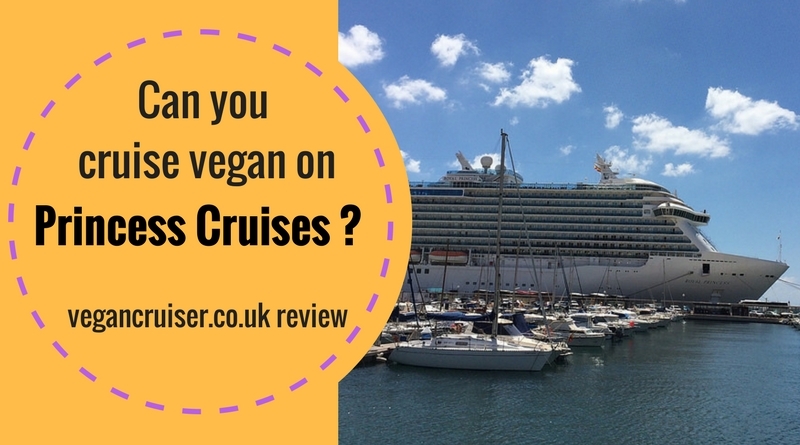 Once you have looked at all of the options and you find yourself considering a Princess cruise, you will no doubt be wondering if can you cruise vegan on Princess Cruises? 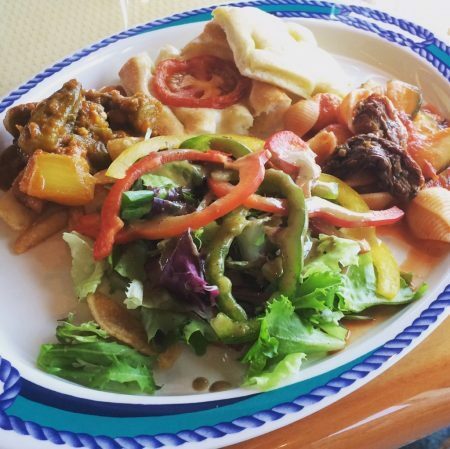 Let me show you how Princess Cruises catered for us. Mr Vegancruiser and I sailed with Princess Cruises, for the first time ever, at the end of last summer. It happened by accident almost as I had my eyes set on a different ship & cruise line. But since MrVC couldn’t get the required dates off from work, we ended up booking Royal Princess for a week-long sailing from Barcelona to Rome. And I too was perhaps a little hesitant, not really knowing how they would cater. Thankfully I found a vegan travel blog (Justin & Lauren) to allay my concern. They had sailed with Princess successfully on a few occasions and shared their food on their blog. 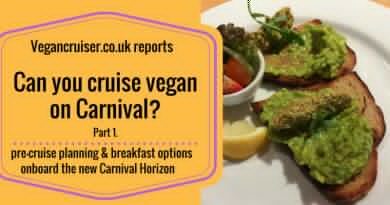 Plus a month before our own sailing I was invited to visit Caribbean Princess as she called at the port of Greenock, and was able to investigate the ‘accidentally vegan’ options in the buffet that day. My plate above has curried okra, focaccia with tomato, pasta shells in tomato sauce and various items from the salad bar. I had notified Princess Cruises dietary customer service team months in advance that we were both vegan and had queried plant milk, pasta and vegan spread availability. The team advised they would have soy milk onboard and vegan veggie burgers (though we never saw any and didn’t request them either). They also confirmed that egg-free pasta is available – something I wanted to know about after our trouble getting pasta dishes at Royal Caribbean. Unfortunately, we found that Princess offer no dairy-free spread, much like most cruise lines. Neither do they stock vegan yoghurt or ice cream – only sorbet. As I had been told no vegan spread was available on Princess, I packed a small vegan avocado spread tub into my checked bag. It survived the 6-hour trip (2 flights) from our home to our cabin as I used a lunch/cooler bag with an extra ice pack for transit. In the cooler bag, I also had a pack Violife cheese slices and Vbites deli meat slices for breakfast use (think of Tofurky deli meat, my US readers). 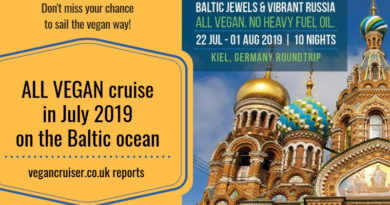 For anything like that included in your cruise fare, need to book one of the 100% vegan river cruises, I featured in my specialist vegan cruises post. Otherwise, be prepared. Do check that your cabin has a fridge, though, as some of the older ships do not automatically have one. Those ships tend to charge a rental fee if you request one. 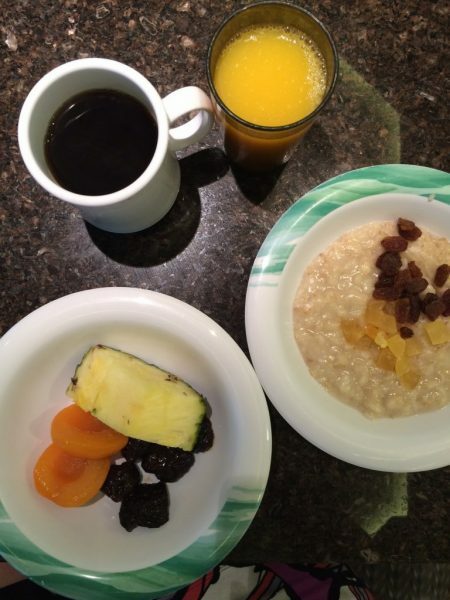 For breakfast, Princess served some familiar warm options, beans and other fried vegetables for toast. Every morning I opted for either porridge, as that is what I would eat at home, or bread with my ‘brought from home vegan extras’. Waiters would get us soy milk at request as they went between tables serving tea or coffee. There were Kellogg’s cereals in individual boxes and I avoided them – thinking they would be fortified UK kind. Since then I have discovered that not all European countries fortify their cereals, so if these were Spanish, they may have been suitable for vegans. Do check. Buffet lunches can be infuriating. Often vegetarian options (salads, soups, chilli) are drizzled with cheese whereas if they were served with the cheese as an optional side many more could enjoy them. And on this one-week sailing, there were one or two occasions when the vegetarian curry had paneer or chilli had cheese on top, meaning we had to have various side vegetables and bread. Thankfully that was rare and most days we could have soup and a main course of some kind. Here’s MrVegancruiser’s Instagram post from our first afternoon onboard. Much like with other cruise lines, once you’ve notified them in advance of your sailing, you should tell the main dining room staff upon arrival in case your request hasn’t been passed on. We were advised that someone would be looking after us all week and we sure were. In addition to the waiter and assistant waiter, every night a fantastic Food and Beverage Manager Ovi would come see us about our meal options for the following day. On the first night as we sailed our of Barcelona, Ovi came to introduce himself and negotiated with the kitchen allergy team to come up with three courses we could have – and apologised for being able to serve only fruit or sorbet for dessert. After our busy day in scorching hot Cartagena, we were well & truly treated at dinner. 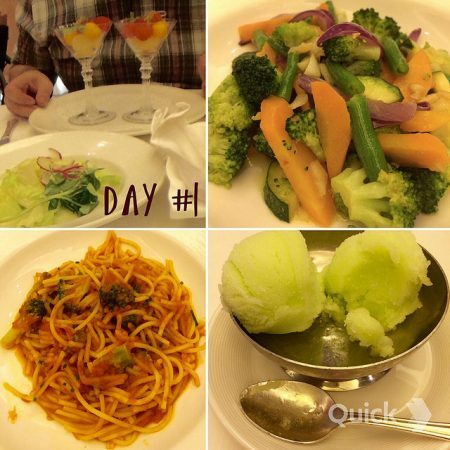 We had been able to order the from the menu – the vegetarian options could easily be made vegan. Our three-course meal consisted of the starter with a change of bread and the veggie main course but with no egg. And Ovi had arranged us a special vegan dessert option. MrVC had to share my love for it with the world… as I was totally flabbergasted. Never before had I been served anything vegan resembling a real dessert on a cruise ship. Our starter was aubergine puree, hummus, roasted peppers and leaves with basil oil drizzle, with crostini swapped for toasted bread. The main course was vegetarian tofu pad thai with no egg. And for dessert – blueberry crumble with raspberry sorbet. Heaven. Specialty restaurants normally carry a separate charge, but not Alfredo’s, which is a nice Princess perk. We could’ve eaten in the buffet too, naturally, but prefer waiter service restaurants at dinner. We had told Ovi that we would be skipping the MDR on the formal nights, so he said he would send our vegan desserts upstairs for us so that we wouldn’t miss out. And we sure didn’t! We ordered the minestrone if it was vegan. Instead we were delivered a vegetable broth which had been made specifically for us. Not the tomato pasta kind I was expecting. For our main courses, we both ordered the veggie pizza from the menu without cheese. Instead of cheese, they came with slices of avocado. For dessert, Ovi’s kitchen team had made us strawberry sponge cake and it was delivered one deck up to Alfredo’s for us. Day four on a sailing was the only sea day, a day of rest, no exploring a port. The perfect day to recover from the night before – if you want to party until the wee hours in the club. On a Royal Caribbean sailing that probably would’ve happened but our Princess cruise was rather subdued. Older age of passengers meant the club wasn’t jumping on any night. The first two courses were pasta shells in tomato sauce with courgette fritters and carrot soup. Our main course was chargrilled tofu steaks served with asparagus and wilted spinach. 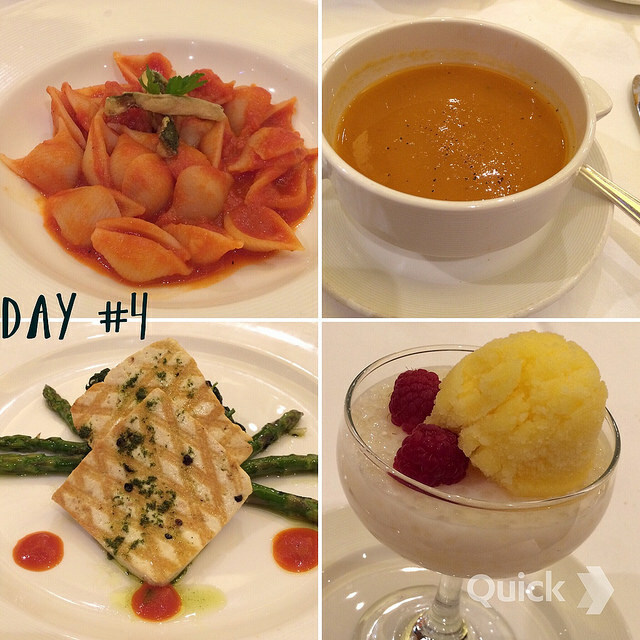 The dessert on day four was tapioca pudding made with rice milk, served with raspberries and orange sorbet. Day five was spent exploring Marseille. We were docked in the industrial port so paid for the 15USD Princess bus service to the city and back. While in Marseille we used the HappyCow app to find a fab wee vegan cafe with chocolate cake. Once again we had four courses waiting for us for dinner, though were only expecting three. 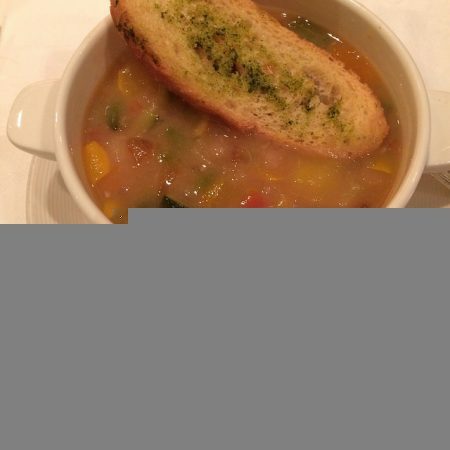 Starters were a warm beany, clear-broth minestrone, followed by a cold peach soup. Chinese soy & ginger stir fry vegetables were served for our main and dessert was a dark chocolate pudding with raspberry (most likely cocoa and non-dairy milk thickened with corn starch). 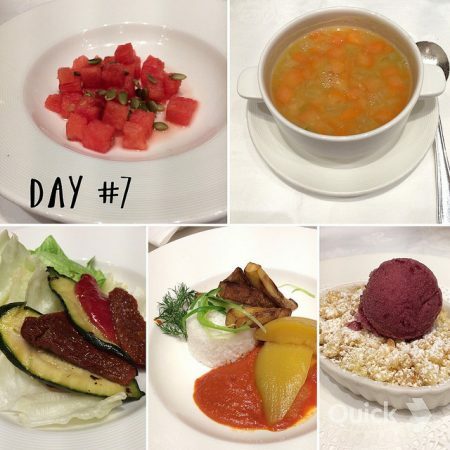 Day six was spent exploring the fabulous Genoa (Genova) and as night 6 was another formal night, we retreated to Alfredo’s for another night of Italian food. Could not resist the pizza, again, just added some extra toppings. For dessert Ovi and his kitchen team had made us some vegan apple pie! Day seven was a fabulous day seeing Pisa and Florence from the port of Livorno. Again HappyCow app lead us to various vegan food venues in town (hot dogs, cheesecake, gelato etc). For our final night in the MDR Ovi and his team had put together a five-course dinner for us. 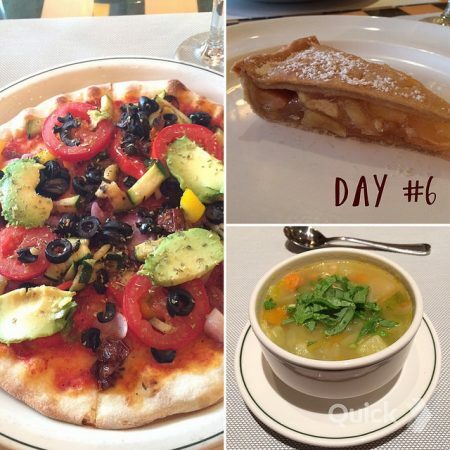 Starters consisted of a watermelon & pumpkin seed salad, followed by pea & vegetable soup. Next course was a Mediterranean roast vegetable salad. Our main course was of a timbale of mango & rice with spiced tomato sauce and aubergine fritters. Dessert on our final night was another fine apple and satsuma crumble topped with raspberry sorbet. We were ever so happy and best fed of our vegan cruises, and spoke to Ovidiu, the Food & Beverage Manager who had looked after us, asking how it was that our experience on Princess was so much better. 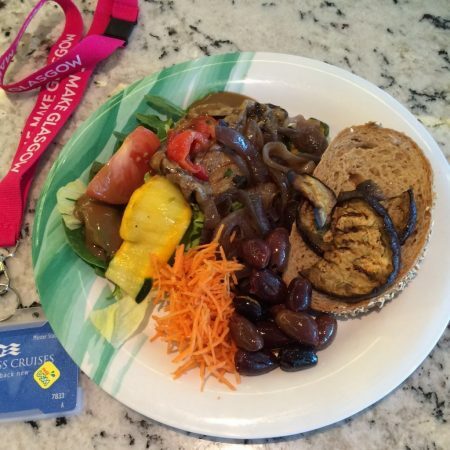 Turned out to be that on this ship management had asked for volunteers with interest in special diets to take on the role of catering for customers with dietary needs. And it so happened to be that Ovi himself has a severe egg allergy so he knew that making egg-free desserts (accidentally vegan) wasn’t impossible or difficult. What a difference his knowledge made to the catering team and our cruise experience. I hope our next Princess cruise will have catering department as knowledgeable! @mspoppadom with Mr Ovidiu Stoian, the man who looked after us so well and arranged all the fantastic food you’ve seen this week. @princesscruises this man did you proud! 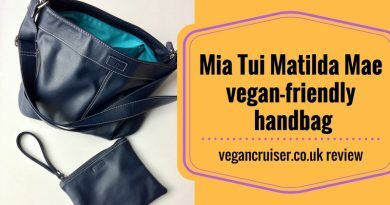 Can you cruise vegan on Princess Cruises? Yes, you clearly can. Do they cater well? 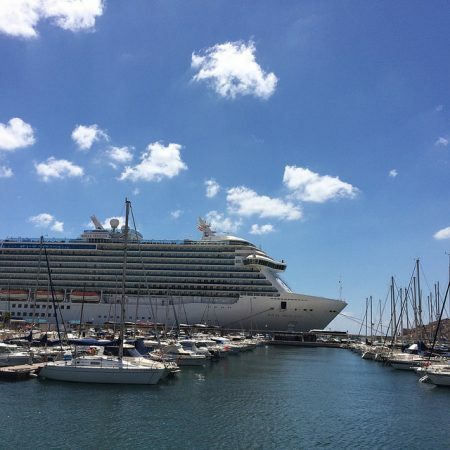 In the case of Royal Princess and Princess Cruises on this sailing – definitely! 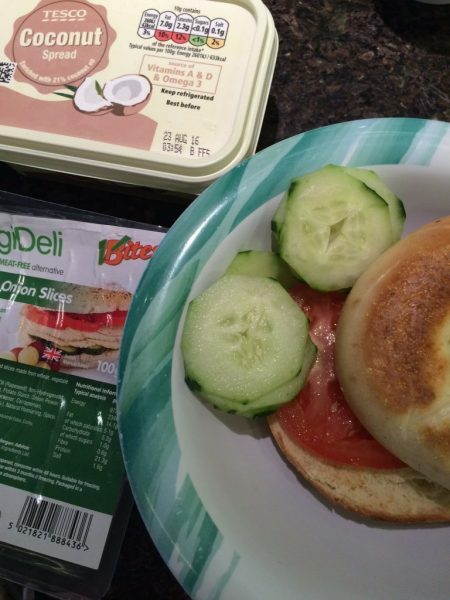 Yes, we took some extras with us and they were great at breakfast time (the vegan spread, cheese and slices). I had brought some Oreos onboard as well for sweet treats. But overall, our evening dining experience was fantastic in not just the quality of food but the service and attitude. Definitely an experience we are looking to repeat. The sooner, the better. If you’re looking for information on Princess’ all-inclusive drinks package, BritsOnAShip have published this helpful post on what is included. Unfortunately, the wine list is not marked for vegan options so if wine is your tipple, you will need to Google or Barnivore search for vegan wines among the 8USD per glass limit. Any question on our dining, vegan cruising or cruising in general, do not hesitate to contact me or comment below! And do come back for the ‘Can you cruise vegan on Royal Caribbean?’ post. It sounds like Ovidiu really made the cruise for you!! Thank you ever so much for putting this info together! Eternally grateful! Hey Missy, many thanks for the comment and so happy you found the post helpful. 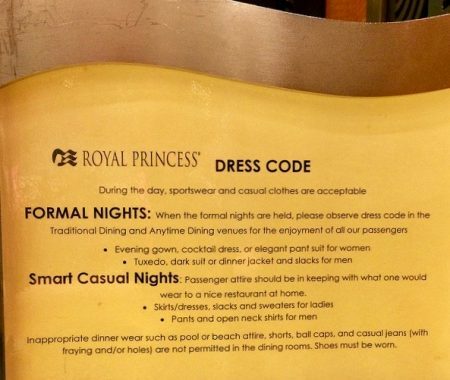 Are you considering a Princess cruise or booked one and were worried they wouldn’t cater?  Oh, and so loving your Etsy shop! Wow, excellent menu. I’m hoping to find Ovidiu on the Royal Princess on Nov 5/17. Thanks for the photo so I can see who to look for. Hi Keith, thanks for the comment. Ovi was one of the head waiters but our cruise was in Aug last year so he’s prob not on Royal right now. People move around ships so often, as contracts are for 9 or so months at a time. Best of luck – hope he’s trained someone else to look after people as well as he did – if he no longer works on that particular ship. Thank you so much for this info. I am accompanying a group on Princess soon, and special diets will be of great importance. Thanks for taking time to comment. 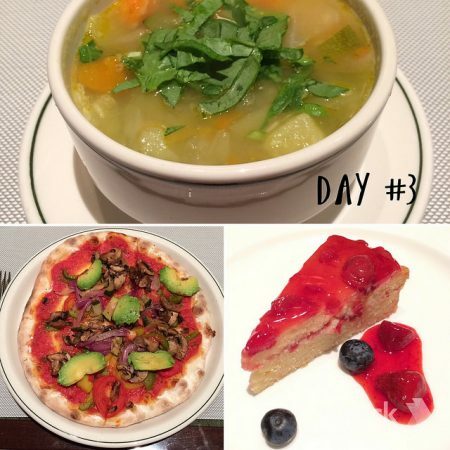 If you look up vegan blog Justin and Lauren they too have posted their Princess experience and food photos. Hope you have a good sailing, despite there not being a vegan menu.